A Seattle Police officer has been removed from patrol duty and is under internal investigation after a study showed that he alone was responsible for 80 percent of the city's marijuana citations. According to police officials, the unnamed officer issued 66 out of 83 citations for illegal marijuana possession or consumption between January and June of this year. The marijuana enforcement study—mandated by the city ordinance that conformed the city's marijuana laws to the state statue legalizing weed—is part of an effort to make sure that enforcement of the city's public marijuana use ordinance weren't being enforced in a "racially disproportionate" manner. "I support enforcing the law, I support warning people before ticketing them and only issuing a ticket if the warning doesn't work, and I support spreading enforcement efforts equitably across the City," Seattle City Attorney Peter Holmes said in a statement on Thursday. 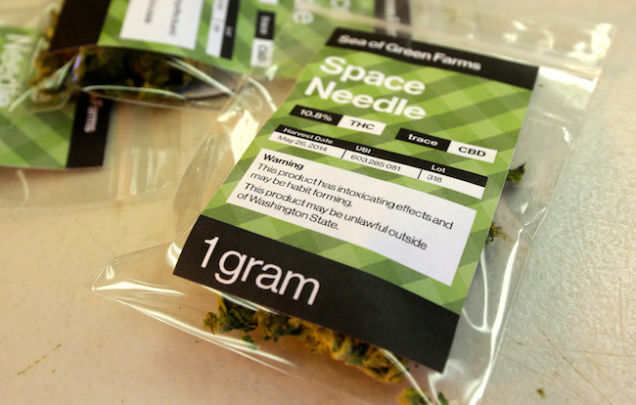 According to a blog statement by Seattle Police Chief Kathleen O'Toole, the officer would occasionally scribble little notes on the citations, including one where he referred to Washington's voter-approved laws legalizing marijuana as "silly." The officer is now under investigation by the department's Office of Professional Accountability, O'Toole said. The study also showed that around 36 percent (30 out of 82) of the citations issued for marijuana in Seattle were given to blacks, who only make up a little over eight percent of the city's population. Smoking weed is legal in Washington state, but the fine for smoking in a public place in Seattle is comparable to drinking alcohol in public place—a $50 plus court costs.